Apple Tree Cottage in Blockley, near Chipping Campden sleeps 2 people. Apple Tree Cottage near Chipping Campden is a hideaway cottage for two in the heart of the Cotswolds. This cosy Grade II listed property is one of four and is idyllically situated within earshot of a cascading stream near an old silk mill in the beautiful unspoiled village of Blockley. 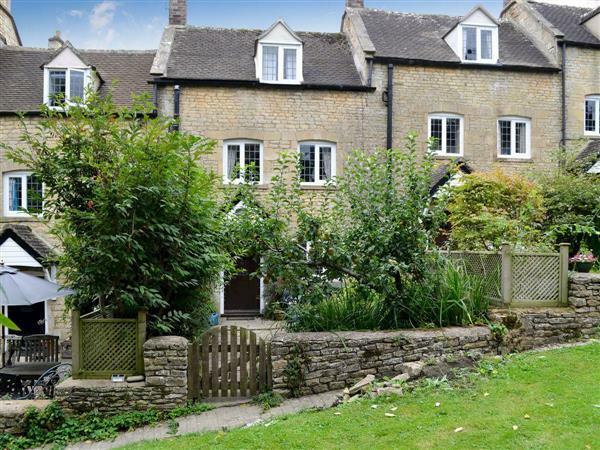 Right away from it all, yet only 4 miles from Moreton-in-Marsh, which has direct rail connection with London Paddington, and under 4 miles from Chipping Campden, Apple Tree Cottage is an ideal base to explore the Cotswolds, either by car or across the countryside on foot. Stratford-on-Avon, Warwick, Cheltenham Spa and Oxford are all nearby for day trips. Within Blockley itself, you can walk from the cottage door on a wide variety of different walks. The village is on several long distance walking routes. Several attractions are within 2-3 miles walking distance of Blockley. These include Sezincote House and gardens, Batsford Arboretum and Bourton House (all three are somewhat nearer by taking the Moreton bus as far as Bourton-on-the-Hill). Of these, Batsford has a café and Sezincote serves teas, and there is a local pub at Bourton-on-the-Hill. Chipping Campden is a delightful walk from Blockley, with several variations of route and can be combined with taking the bus one way. The cottage is arranged over three floors. You enter the cottage into a welcoming kitchen/dining room, with a wood burner set into a brick fireplace. On the first floor there is a living room with twin window seats overlooking the garden and grounds. The second floor double bedroom has an attractive apex ceiling with exposed beams, a dormer window and an en-suite bathroom with shower and bath. Immediately adjoining the cottage is a peaceful patio garden with table and chairs, leading to the leafy grounds and parking area shared with the other properties. The shop, pub and restaurant are ¼ mile from Apple Tree Cottage near Chipping Campden. Kitchen/dining room: With wood burner, electric oven, electric hob, microwave/oven/grill combi and fridge. Gas central heating, electricity, bed linen, towels, Wi-Fi and logs for wood burner included. Patio garden with sitting-out area and garden furniture. Communal car park. No smoking. Please note: No children. Holidays at Apple Tree Cottage run from Saturday to Saturday. Pets allowed at Apple Tree Cottage. Apple Tree Cottage is in Gloucestershire; should you be on the lookout for a special offer, you can find all the special offers in Gloucestershire. It's always worth checking to see what is on offer at the moment. Do you want to holiday near Apple Tree Cottage (UKC891), you can see other cottages within 25 miles of Apple Tree Cottage; have a look to find your perfect holiday location.